Don't miss the chance to add the final coin in the Perth Mint's exceptional Lunar II series to your collection or portfolio. The 2019 1 oz Lunar II Year of the Pig silver coin is struck from .9999 pure silver and has all the stunning design details you'd expect from Australia's famous mint. As always, mintage is limited and only 300,000 will be available worldwide. Based on past performance, the 2019 1 oz Lunar II Year of the Pig silver coin is likely to sell out quickly – order now with coininvest.com to avoid disappointment. The Lunar II series was launched with the Year of the Rat coin in 2008 following the unprecedented success of the mint's Lunar I series. Celebrating the 12 mythical creatures of the ancient Chinese zodiac, Lunar II is considered one of the world's most beautifully-designed coin collections. Incredibly, the 12-year cycle is coming to an end once more as the Perth Mint presents the impressive 2019 Year of the Pig silver coin. The 2019 1 oz Lunar II Year of the Pig silver coin features a superbly crafted reverse design of an adult pig standing under a branch with four piglets playing among plants at its feet. The legend 'Year of the Pig' is inscribed along the bottom edge and the coin's reverse also features the Chinese pinyin character for ‘pig’ and mint's famous 'P' mintmark. The coin's reverse carries the Sir Ian Rank-Broadley portrait of HM Queen Elizabeth II that is commonly used on the country's legal tender coinage. 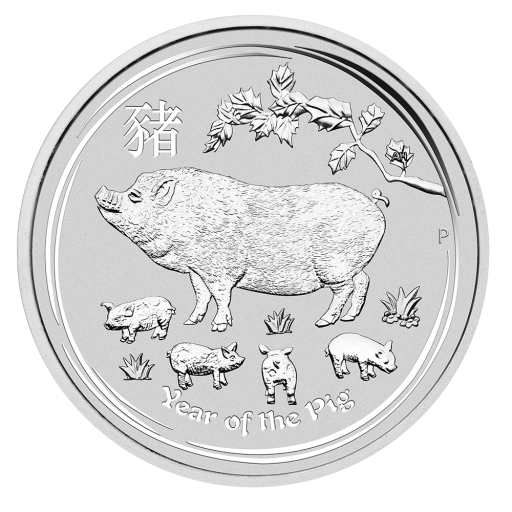 Why choose the 2019 1 oz Lunar II Year of the Pig silver coin? 2019 1 oz Year of the Pig silver coins are an excellent option for investors as well as an essential buy for fans of the Lunar II series. People born under the sign of the pig are said to be loyal, sincere and calm and these shimmering silver coins also make wonderful gifts for those born in 1947, 1959, 1971, 1983, 1995, 2007 or 2019. Don't delay! 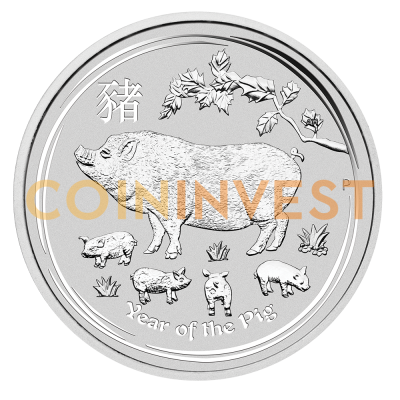 Order your 2019 1 oz Lunar II Year of the Pig silver coins now with coininvest.com. Coins are available singly, as multiples of 20, in foil or as boxes of 100.